The copyright of the book never belonged to its author, but to its publisher Lyle Stuart. Stuart kept publishing the book until the company was bought in 1991 by Steven Schragis, who decided to drop it. Out of the 2,000 books published by the company, it was the only one that Schragis decided to stop publishing. Schragis said publishers have a responsibility to the public, and the book had no positive social purpose that could justify keeping it in print. In December 2013, it was reported that the copyright had been bought in 2002 by Delta Press, an Arkansas-based publisher that specialises in controversial books, and the book is their “most-asked-for volume”. The latest publication date is October 16, 2012 (ISBN 978-1607965237), and the book is available in both paperback and hardback from Snowball Publishing. Reviewers say the copy has its basis in a 2002 revision and shows heavy editing and many items removed over the original 1971 edition. Since writing the book, Powell converted to Anglicanism in 1976 and attempted to have the book removed from circulation. When Lyle Stuart published the book, its copyright was taken out in the publisher’s name, not Powell’s, and the current publisher had no desire to remove the book from print. Powell has written his desire to see it removed from circulation, as he stopped advocating what he had written. On 19 December 2013, William Powell wrote an article in The Guardian to call for the book to “quickly and quietly go out of print”. Powell died in July 2016. At the time of its publication, one Federal Bureau of Investigation memo described The Anarchist Cookbook as “one of the crudest, low-brow, paranoiac writing efforts ever attempted”. In 2010, the FBI released the bulk of its investigative file on The Anarchist Cookbook. Advocates of anarchism dispute the association of the book with anarchist political philosophy. The anarchist collective CrimethInc., which published the book Recipes for Disaster: An Anarchist Cookbook in response, denounces the earlier book, saying it was “not composed or released by anarchists, not derived from anarchist practice, not intended to promote freedom and autonomy or challenge repressive power – and was barely a cookbook, as most of the recipes in it are notoriously unreliable”. Much of the publication was copied and made available as text documents online through Usenet and FTP sites hosted in academic institutions in the early 1990s, and has been made available via web browsers from their inception in the mid-1990s to the present day. The name varies slightly from Anarchist Cookbook to Anarchy Cookbook and the topics have expanded vastly in the intervening decades. Many of the articles were attributed to an anonymous author called The Jolly Roger. In 2001, British businessman Terrance Brown created the now defunct website anarchist-cookbook.com and sold copies of his derivative work, entitled Anarchist Cookbook 2000. Knowledge of the book, or copied online publications of it, increased along with the increase in public access to the Internet throughout the mid-1990s. Newspapers ran stories about how easy the text was to get hold of, and the influence it may have had with terrorists, criminals and experimental teenagers. The book was refused classification by the Office of Film and Literature Classification upon release, thus making the book banned in Australia. It was classified RC again on 31 October 2016. In 2007, a 17-year-old was arrested in the United Kingdom and faced charges under anti-terrorism law in the UK for possession of this book, among other things . He was cleared of all charges in October 2008, after arguing that he was a prankster who just wanted to research fireworks and smoke bombs. In County Durham, UK in 2010, Ian Davison and his son were imprisoned under anti-terrorism laws for the manufacturing of ricin, and their possession of The Anarchist Cookbook, along with its availability, was noted by the authorities. In 2013, renewed calls were made in the United States to ban this book, citing links to a school shooting in Colorado by Karl Pierson. 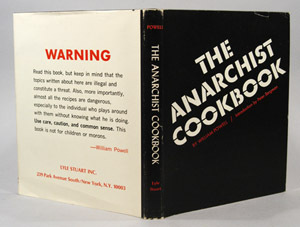 The Anarchist Cookbook will shock, it will disturb, it will provoke. It places in historical perspective an era when “Turn on, Burn down, Blow up” are revolutionary slogans of the day. Says the author” “This book… is not written for the members of fringe political groups, such as the Weatherman, or The Minutemen. Those radical groups don’t need this book. They already know everything that’s in here. If the real people of America, the silent majority, are going to survive, they must educate themselves. That is the purpose of this book.” In what the author considers a survival guide, there is explicit information on the uses and effects of drugs, ranging from pot to heroin to peanuts. There i detailed advice concerning electronics, sabotage, and surveillance, with data on everything from bugs to scramblers. There is a comprehensive chapter on natural, non-lethal, and lethal weapons, running the gamut from cattle prods to submachine guns to bows and arrows. The section on explosives and booby traps ranges from TNT to whistle traps. One hundred and eleven drawings supplement the recipes. “This book is for anarchists,” says William Powell, “Those who feel able to discipline themselves on all the subjects from drugs, to weapons, to explosives) that are currently illegal in this country.” Techniques, disciplines, precautions, and warnings pervade what may be the most disquieting “how-to” book of contemporary times.